The chart uses a measure called the CAPE Ratio or the Cyclically Adjusted Price Earnings Ratio. The CAPE Ratio was developed by professor Robert Shiller of Yale University as a way to reduce the impact of cyclical earnings when measuring the valuation of stock markets. It is comparable to the more standard PE or price to earnings ratio. It is calculated by dividing the price of stock market by the average of the last ten years of real or inflation adjusted earnings. Professor Shiller has calculated the CAPE ratio for the US Stock market all the way back to 1871 and he updates the ratio monthly. Shiller uses the CAPE ratio to judge the prospective attractiveness of the stock market (i.e. do future returns look high or low). When the ratio is high, the market is overvalued and future returns look low. When the ratio is low the opposite is true, and future returns look high. In Shiller’s analysis he calculates the CAPE ratio at a certain point time and then calculates the subsequent ten year returns. He then analyzes the data to look for a relationship or a correlation between the CAPE and subsequent returns. The chart above shows the relationship. To understand the chart, first focus on the colors. The legend to the left shows that each color represents a certain CAPE range. Red when the CAPE is very high, dark green when the CAPE is low. On the right at the bottom are ten year return ranges. Starting with <0% on the left and 15 to 20% on the right. 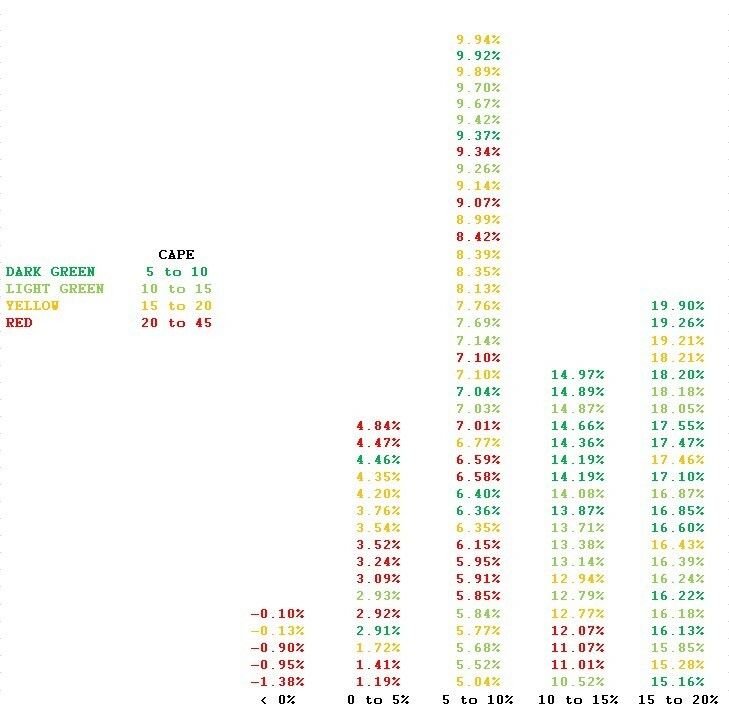 Each of the returns in the table is ten year annualized return with its color representing the CAPE ratio at the start of the period. So what would we hope to see? If there is a relationship between the CAPE ratio and subsequent returns, we would expect to see high CAPE ratios resulting in low subsequent returns and low CAPE ratios resulting in high subsequent returns. Using the color legend, we would expect to see a lot of red on the left side of the chart and lot of dark green on the right side, which is exactly what we see. There is a relationship between CAPE and subsequent returns and in fact it appears to be a rather strong one. How can we use this relationship when making investment decisions? To answer the questions, let’s consider the CAPE Ratio today. The CAPE today for the US stock market stands at 30. Right in the middle of the red zone. What could we anticipate stocks returns to be the next ten years? Looking at the chart we clearly should focus on the lower returns on the left side of the chart. There have been a couple periods when the CAPE was very high and returns exceeded 10% but the probability is quite low. In fact, the probability is high that returns will be less than 10% and could be substantially less than 10%. Less than 0% has only occurred when the CAPE is in its current range. If we consider the long term return of stocks to be about 10%, the probability is very high that we will not be able to do better than 10%. This is valuable information when making decisions between stocks and bonds and when making decisions about what types of stocks to buy. As an example, the current CAPE ratio for emerging markets is in the dark green range. Therefore, we have overweighted emerging markets versus US stocks because the probability is high that they will outperform. Is it perfect? Absolutely not. There is not perfect system to forecasting returns, but hopefully you can see the value of having this kind of information when making investment decisions. The CAPE ratio has no value in predicting short term returns, which is why we think many investors downplay its significance in making investment decisions. Most investors think in terms of days and weeks while we try to emphasize the time periods that are most critical to our investors which is decades and longer time periods. This is after all most investor’s time horizon. If the time horizon for needing funds is much shorter, stocks probably should be avoided completely. So to recap. Using the CAPE ratio and the chart we’ve concluded that there is a 90% chance that US stock market returns will be less than 10% with a decent probability they will be less than 0%. Not a bad outcome using a simple chart.